Now that the packet is up and running, I wanted to talk about why I was compelled to create these lessons…As you know, the career you choose is one of the most important decisions in life. Your career plays a highly influential role in your health and happiness – it can give you a purpose, be a great source of great stress, provide financial security, connect you to a social network, and so much more. For these reasons preparing students for their future should be one of the core objectives of our educational system. However, even though we know this is how it should be, I honestly don’t felt like we (my school) have been doing a stellar job at achieving this objective. As I was evaluating our lack of career discovery activities, I realized that I could do my part by focusing our Occupational Health unit on career discovery and exploration! So in connection to my multidimensional and interconnected approach to health, I created three activities that empower students to look beyond the size of the paycheck to what actually makes a career a good or bad fit. 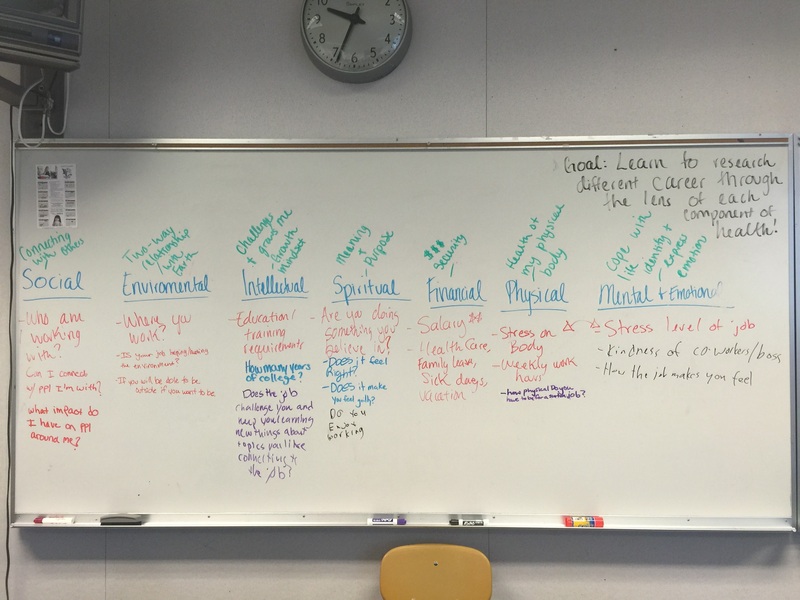 Essentially, my goal was for students to understand how a career impacts each component of health. 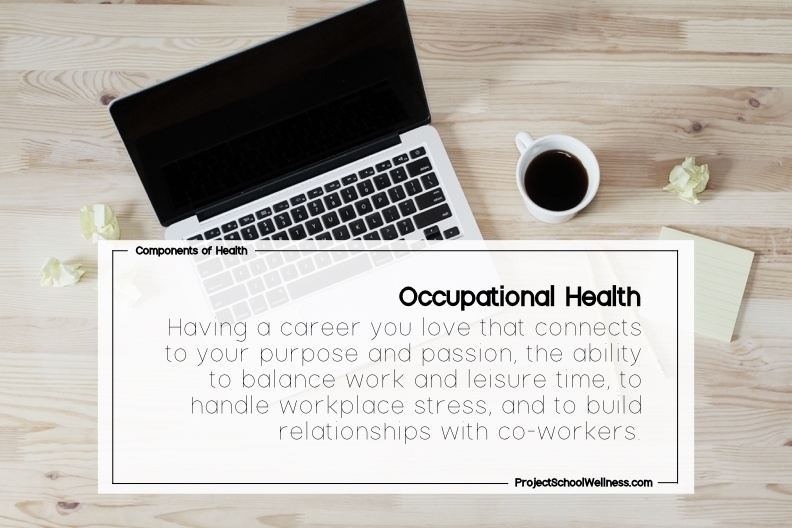 For these lessons, the first step of instruction was to refresh students on the components of health and the definition of Occupational Health. Okay, now that I’ve explained the why…let’s get down to the what! Here’s what I did…I developed three activities: Level 1 (6th Grade), Level 2 (7th Grade), and Level 3 (8th Grade). Each lesson started with a refresher on the total health framework and then we discussed how your job impacts each component of health. Then after the discussion, each class completed their respective worksheets. 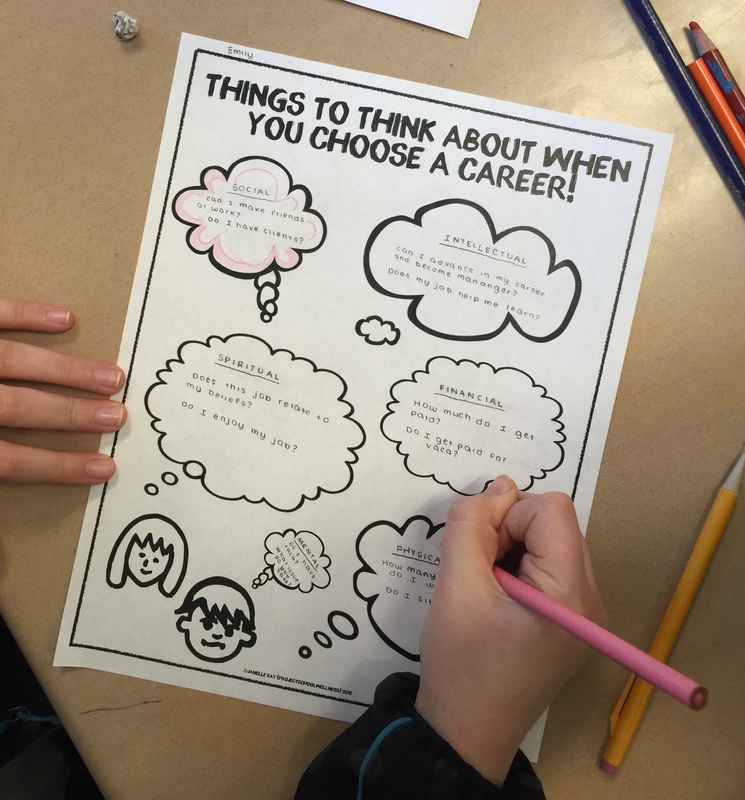 Level One: Things to think about when choosing a career! Some students took the assignment a step further by customizing their poster to their desired career (⇑!). 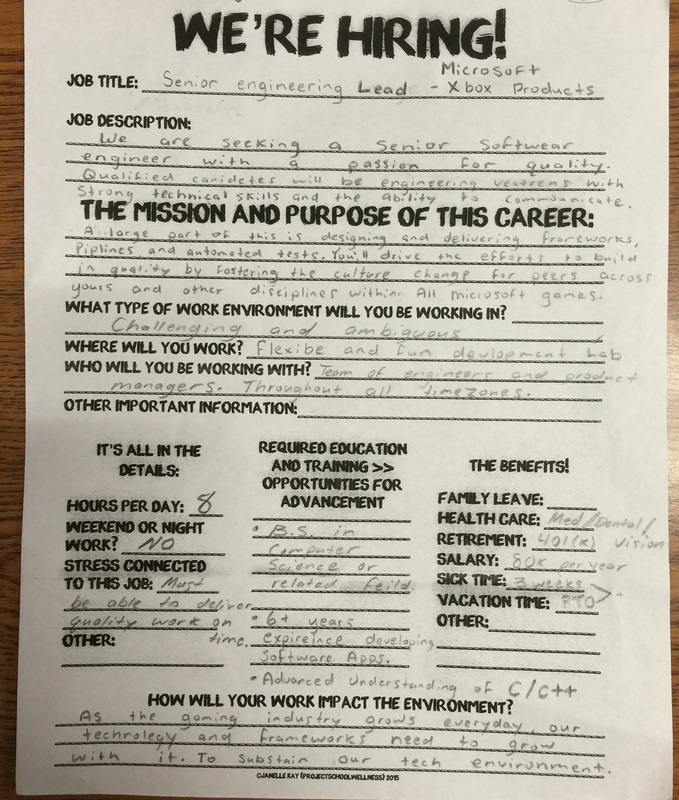 For the level three worksheet students conducted an in-depth review of the career they were most interested in. The worksheets also made great wall posters. For each of the worksheets, it was necessary for students to recall information they’ve learned in previous Health classes. 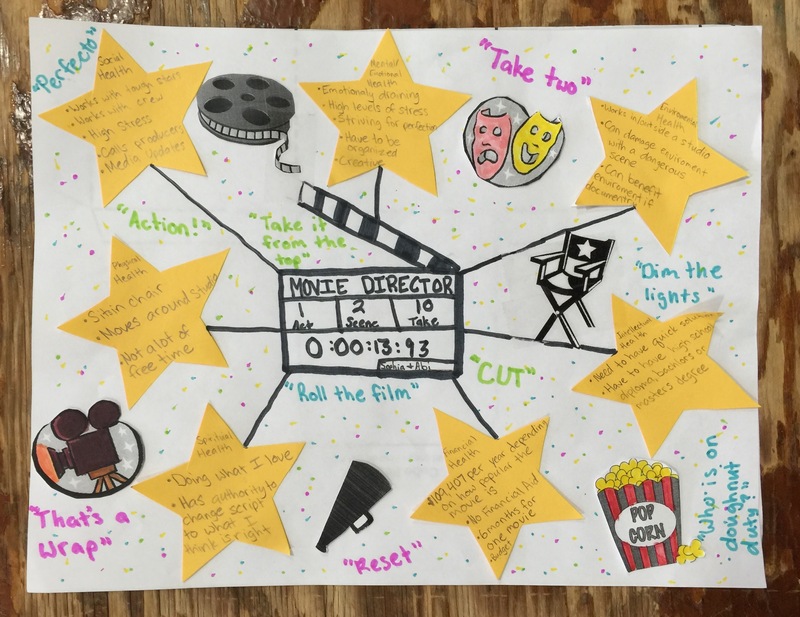 When students were stuck, I encouraged them to take ownership of their learning and use the posters on my classroom wall + all of the connections from this Post It activity to guide help guide their learning. To end the lesson, we regrouped and shared discoveries. This was my favorite part because I absolutely love hearing kids dream about their future. My only fear is that they stay dreams. Hopefully lessons like this help my students better understand how to turn dreams into reality! Cathy gave me an info sheet on your resources. EXCELLENT JOB on the whole web presence! I am teaching Planning 10 and will look for inspiration on the Career Education resources. Thank you so much! I appreciate your kind words. Let me know if you need some assistance, I am happy to help out! !